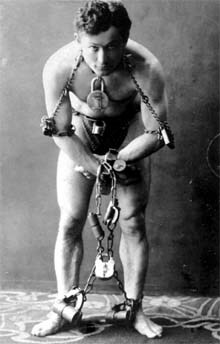 Houdini was a great escape artist, but not so good a conjurer. (04/09) Houdini was a lousy magician. I know that this one statement will probably get me hate mail from the four corners of the globe, but it's the conclusion you reach after reading Jim Steinmeyer's book Hiding the Elephant. Though most people would not recognize his name, Steinmeyer is one of the most brilliant, modern creators of magic tricks (he's the guy who taught David Copperfield how to make the State of Liberty disappear). Steinmeyer has built tricks for some of the best in the business, including Lance Burton, Doug Henning and Rick Thomas. In addition to making magic tricks, however, Steinmeyer is also a student of magic history. His book tells about the golden era of magic starting in the mid-19th century and running through the 1940's. Houdini lived in the middle of this time period from 1874 to 1926. What interested me in Steinmeyer's book, however, was not just the history of magic, but some parallels that can be drawn from it to learning and education. I think the difference between a great teacher and a mediocre teacher is a lot like the difference between a great magician and a mediocre magician. Most teachers have the same basic knowledge to give to students in a similar way to how all magicians have the same basic illusions to display. What makes a magician great is how he presents his illusion. The same is true in teaching. Before we get into that discussion, however, we need to go back to Houdini. Despite what I've said up to this point, after reading Hiding the Elephant you don't come to the conclusion that a Houdini show was dull or boring. Not at all. As an escape artist, a subset of magic he practically invented, he had no equal. As a child Orson Wells, who wasn't a bad magician himself, saw Houdini perform his escapes and pronounced them "thrilling." However, when Houdini's act moved on to conjuring - that is making things appear and disappear - Wells was disappointed. "It was awful stuff," he recalled. Why did Houdini have such a hard time with this type of magic? It required a finesse which he simply didn't have. Steinmeyer writes in his book "Watching him play the part of an elegant conjurer was a bit like watching a wrestler play the violin." Perhaps the best example of Houdini's problem in this area is the story of the vanishing elephant. 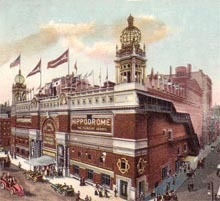 New York's largest theater in 1918, the Hippodrome. Houdini was well aware of his shortcomings as a magician and very much wanted to show the public and his fellow prestidigitators that he was a world class conjurer. In 1918 he got his chance. Early that year Houdini was engaged for 19 weeks as a feature player at New York's Hippodrome. At that time the Hippodrome was the largest theater in the city seating almost 6,000 people. The immense stage featured lavish spectacles complete with circus animals, diving horses, dancing girls and choruses. The entire stage could be turned into a massive pool that was sometimes used to re-stage famous naval battles. According to Houdini, it was while he was watching the elephants perform at the Hippodrome that he had a wonderful idea. One of the most impressive feats of the conjurer was to make a live animal appear or disappear. Because magicians were constantly traveling from location to location, the creature used was usually something small like a bird, rabbit or dog. Some of the more impressive tricks, however, had involved a larger animal like a donkey. Here Houdini would have elephants available to him for the entire 19 weeks he was working at the Hippodrome. Suppose he made one of them disappear? He would be considered the greatest conjurer of all time! It took Houdini several weeks to work out the details (in conjunction with Charles Morritt, another magician and illusion designer), but by the time he debuted at the Hippodrome the trick was ready. Houdini and Jennie in a publicity still. 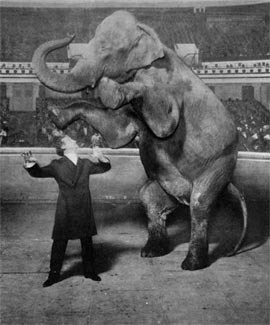 Houdini would appear on the stage and Jennie, a 10,000 pound elephant, would be led out by her trainer. 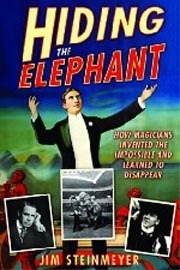 Houdini would introduce her as "The Vanishing Elephant" while 15 assistants rolled a giant box out onto the stage. The box was eight feet high and eight feet wide and probably about fourteen feet in length. It was also elevated more than two feet in the air so that the audience could see underneath it and know that the elephant wasn't going through a trap door in the floor. Houdini would have the small end of the box turned to face the spectators. He would then open doors on either end so they could see through it and be assured it was empty. The box would then be turned so the long part faced the audience and a ramp would be put up by the door. The trainer would lead the elephant inside and the doors would be closed. The assistants would then turn the box again so it faced the audience and the doors would be opened. The spectators looking through could see out the other side. No elephant. It had apparently vanished. The Hippodrome being of such a colossal size, only those sitting directly in front got the real benefit of the deception. The few hundred people sitting around me took Houdini's word for it that the "animile" had gone - we couldn't see into the box at all! 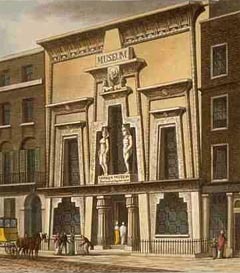 The now demolished Egyptian Hall in London exhibited Stodare's "Sphinx" illusion. Compare this with the "Sphinx" illusion presented by an earlier Victorian magician named Colonel Joseph Stodare. Stodare was working a theater called Egyptian Hall in London. The theater had once been a museum and was adorned with Egyptian sculpture and hieroglyphics. When a new illusion mechanism became available to him, Stodare decided to work the theater's theme into the trick. For weeks before unveiling his illusion, Stodare placed cryptic ads on the front page of the London Times like "The Sphinx has left Egypt," and "The Sphinx has arrived and will soon appear." When he finally premiered the trick, the hall was packed with the curious. When the curtains were opened the audience was greeted with a small, round, thin, bare three-legged table with no tablecloth. Stodare would walk onto the stage carrying a fabric covered traveling case about a foot high, wide and deep. 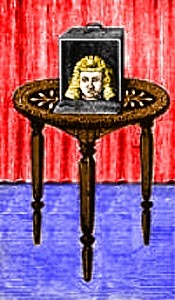 After placing it on the center of the table, he would open the hinged doors in front to reveal what appeared to be a sculpture of a head in Egyptian headdress. Stodare would move to the edge of the stage, then command, "Sphinx, awake!" The eyes of the sculpture would pop open and look around, slowly appearing to become aware of its surroundings. Suddenly it became clear to the audience that they were viewing a disembodied human head. Stodare would ask it questions and the Sphinx would answer. The head finally gave a short speech and closed its eyes. Stodare would then return to the table, close the doors and spend a moment reflecting on the mysterious nature of the Sphinx. When he reopened the box the head was gone, replaced with a pile of ashes. Stodare then carried the box to the edge of the stage so the audience could get a better look at it. The Egyptian Hall rang with applause and the next day the papers were filled with acclaim. "The Sphinx is the most remarkable deception ever included in a conjurer's programme," proclaimed the Daily News. The following month Stodare found himself performing for royalty at Windsor Castle. Why did Stodare's illusion work so well and Houdini's didn't? From a technical point of view, both tricks were amazing for their times. One, however, created a sense of wonder with the audience and the other didn't. A drawing of Stodare's Sphinx Illusion. First, Stodare got people engaged in thinking about the illusion before he did it. His cryptic ads caught their imagination. They made people think about the sphinx. What did they already know about it? What did it mean that it was coming to London? Secondly, Stodare's presentation had a story arc. He placed the sculpture onto the table. He awakened it. He engaged it in conversation. Finally he closes his presentation reminding his audience about the mystical nature of the sphinx and when he opens the box again it has turned to ashes. Finally, Stodare not only made sure the entire audience could clearly see the Sphinx during the performance, at the end of the performance he carried the open box to the edge of the stage so they could get a better look. This way they could see it with their own eyes and be absolutely sure it was empty. This differed from what Houdini did with the elephant. He did plenty of advertising, but it didn't really entice people to think about elephants the way Stodare's cryptic statements did about the Sphinx. Houdini had no story behind his trick; he simply shoved the elephant in the box and presto it was gone. Finally, and most importantly, lots of people couldn't really see the elephant disappear. They only knew it had because Houdini had told them so. What does this have to do with teaching? Everything. A good lesson is like a good magic trick. As Stodare enticed his audience with his riddle-like statements even before they got in the theater, a good teacher must grab the student's attention at the beginning of the lesson. I've heard a couple of terms for this, but where I got my degree they called it "the hook." Hooks can be as simple as an intriguing story, joke or riddle or as complicated as a fun quiz or video clip. The key is that they grab the student and are somehow linked into your subject. The best hooks also "activate" the student's current knowledge. That is, they remind the student of what he already knows about a subject so he will be more prepared to learn the new material. Jim Steinmeyer's book on the history of magic tells you something about education too. Stodare's trick had a whole story to it. A good lesson, in the same way, is like a story. It has a beginning, a middle and an end. There is a flow to it. One item logically follows another in quick succession. A good lesson may even have elements of drama in it. While this is easier when dealing with social studies and history which lend themselves to good stories, it is also possible with the sciences. A couple years ago I integrated a 40-year-old science fiction TV drama about scientists lost in time into learning the mechanics of reading clocks and calendars for my 4th grade class (Time Tunnel to Fourth Grade). It was one of the best units I ever created and one of the most fun and memorable for my kids. A good storyteller also makes sure that he gives his audience the necessary background information needed to understand his tale before launching into it. He needs to make sure his listeners aren't lost from the get go. This kind of thing sounds obvious, but when doing a lesson many teachers find they have assumed their students have come to class with more background information than they actually have. It is very easy for a 40-year-old teacher to forget that his 4th grade students weren't even alive a decade ago. They might well know that Hillary Clinton ran for President, but not be aware that her husband, Bill, actually was the president back in the 90's. Finally, in a good lesson, the student must be able to see (or discover) for themselves the point of it. In education we call this "constructing your own knowledge." Stodare's audience was able to construct their own knowledge about the Sphinx disappearing because they saw it for themselves, not because he told them it disappeared. The same idea works in a classroom. For example, in a science lesson a good science teacher doesn't just tell his class that you can separate hydrogen and oxygen from water by electrolysis. He demonstrates it for them in front of their own eyes. Even better, if he has the time and the equipment, he lets them do the experiment and figure out how the reaction works by themselves, rather than just giving them the information. People remember things they have done and have figured out on their own. Things they've just heard about they often forget. 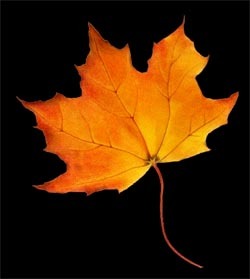 A fall leaf can always be a source of wonder to a student if presented right. A lesson done right, like a magic trick done right, leaves the audience with a sense of wonder. In his book, Steinmeyer tells a story about how as a boy he was fascinated with why the leaves of tree turned red in the fall. When he reached the 4th grade, his teacher told him that the chlorophyll in the leaf dies in the autumn, leaving a bright color. "I appreciated that the mystery had been completely solved," he writes, "and I could stop worrying about it." However Steinmeyer also writes that "Unfortunately, science often serves the purpose of actively teaching us to stop wondering about things, causing us to lose interest." I submit that this is true of science, and learning in general, only if it is done wrong. Good science, like good learning, answers questions at the same time it poses more for the student to think about. Wondering what it would look like to ride a bicycle at the speed of light helped Einstein to create his theory of relativity. Wondering why apples fall helped Newton think about how the laws of gravity and motion might work. Like good magic, good teaching should always leave the viewer with a sense of wonder.